Thirty some years in corporate L&D defined for me an awesome journey of personal learning experiences filled with mountain top moments and dark valleys along the way. Regardless of riding high on amazing successes or being redirected by impressive failures, there remained one simple truth – all of these experiences are a result of Living in Learning the whole time. 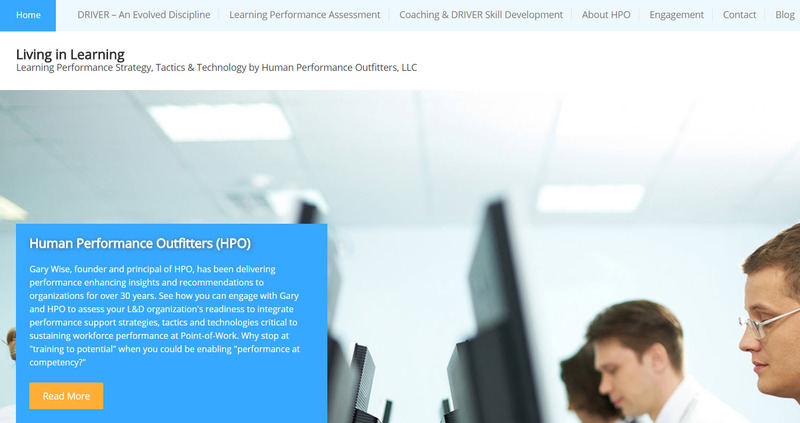 This is an exciting time of celebration, and to christen my gig economy shingle, I’ve launched a new website Living in Learning by Human Performance Outfitters (HPO). Living in Learning has been the name of my blog since 2009, and HPO was established in 2004 after the Chapter 11 shock and awe event that first triggered the self-survival instinct. Now they live together under the same roof. Please stop by and share your thoughts, likes, dislikes, and ideas about Living in Learning. As always, I welcome the opportunity to share knowledge and convictions that Point-of-Work Solutions define for us [L&D] a new ground zero for impacting workforce performance and generating sustainable, measurable business outcomes. Thanks to all of you who already follow Living in Learning, and I welcome first-time visitors to follow the blog as well to ensure you receive notifications of new activities and posts as they happen. Even when we are engaged in our respective jobs we should be Living in Learning as part of our work! Welcome to the gig world! The community of learning, of those who share, and those who open minds and virtual doors is powerful! Like the new site too – and let me know how I can help too. Thanks Bill. Stay in touch! G.